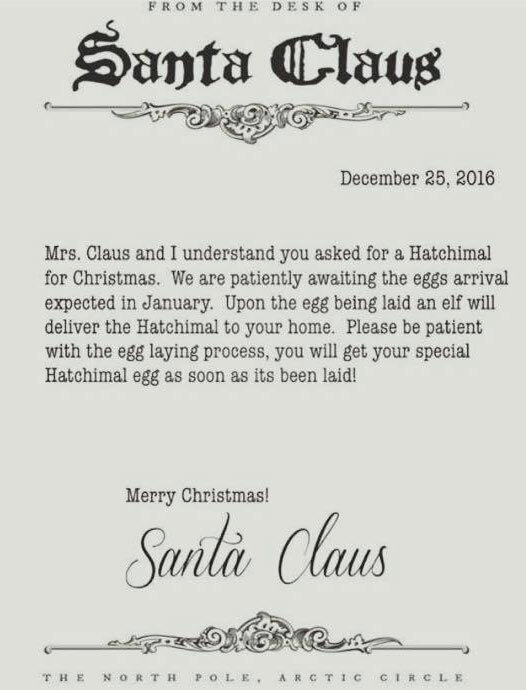 Anxious parents write apologies from Santa, because Hatchimal shortage! Gasp! The shortage of this year’s gift of choice for under 10’s – the Hatchimal – has some very strung-out parents planning ahead. They’re preparing letters of apology “from Santa’, hoping to temper Christmas morning disappointment in children who miss out on the much-hoped-for toy. Wait, what?! While it’s 100 percent true that some children will be broken-hearted when their eagerly anticipated Hatchimal does not reveal itself under the 2016 tree, do we really need the man in the red suit to take the blame? Apparently, for some parents, the answer is yes! The toy has been sold out for weeks at many outlets and desperate times call for desperate measures, it would seem. In scenes not seen since the days of Cabbage Patch Kids, usually honest and law-abiding parents are seeking out black market Santa letters, downloading them in the dead of night and printing them on the most fancy, North-Pole-appropriate stationery they can find. These letters are crude forgeries that purport to be the jolly man’s own missives. To the untrained, festively bleary eye, they may even pass as the real thing. A swathe of these printable apologies have popped up across the internet. Worried, empty-handed parents facing the prospect of teary Christmas mornings are hoping that the gently worded ‘no Hatchimal for you’ note may ease the pain and stop Christmas being ruined. Attempting to dull the agony of a no-Hatchimal-Christmas with these forgeries is obviously a last-ditch, desperate act by parents hoping to ward off tiny tyrant tantrums. Let’s face it, who doesn’t want to keep things merry and bright? Sadly, in their anxious haste many have forgotten that by taking part in this Santa scam, they are guaranteeing their own place on the naughty list. Rock. Hard place. Dang. We admit this sneaky Santa forgery trend is freaking us out a bit. Is Christmas really just a case of kids getting exactly what they want? No. And are we setting everyone up for distress and disappointment by encouraging our kids to write wishlists and tell Santa what they’d like to see under the tree? Yes. Maybe we’d do better to concentrate on the celebratory aspects of Christmas and spending time with family and friends. Because this Santa forgery scam could be a giant warning. Before we know it, we’ll have a sleigh licence racket or some kind of reindeer snack mafia overshadowing what is meant to be a magical time of year. Shudder. Stop forging Santa letters, people!